Build taco: tortilla, sauce, lettuce, steak/cheese and onions. No smoker? No worry, cause these are so delicious and cook just in the oven. Remove and devour, I mean serve. BEST CARNE ASADA FRIES, EVER! As great as brisket is for dinner, it's fantastic and arguably better the next day for sandwiches. Sometimes I forget how good flank steak is – this just brought the memories flooding back. Pre-heat grill to medium high for at least 10 minutes, remove flank from bag (throw away marinade) cook about 4 minutes on first side for medium rare. Flip steak over and brush the top with basting sauce, and cook 2nd side cook about 3 minutes or so, flip again and baste with more sauce. Slice into thin strips across grain to serve. I know what you're thinking, and if you thinking buttery, delicious and amazing… you're right. If that's not what you're thinking, maybe you should try this first. Take chicken off grill, brush with softened butter one last time and serve – in a sandwich, sliced on some pasta or use on a salad. In medium bowl add corn starch and beef, coat the beef well but shake off excess - set aside. 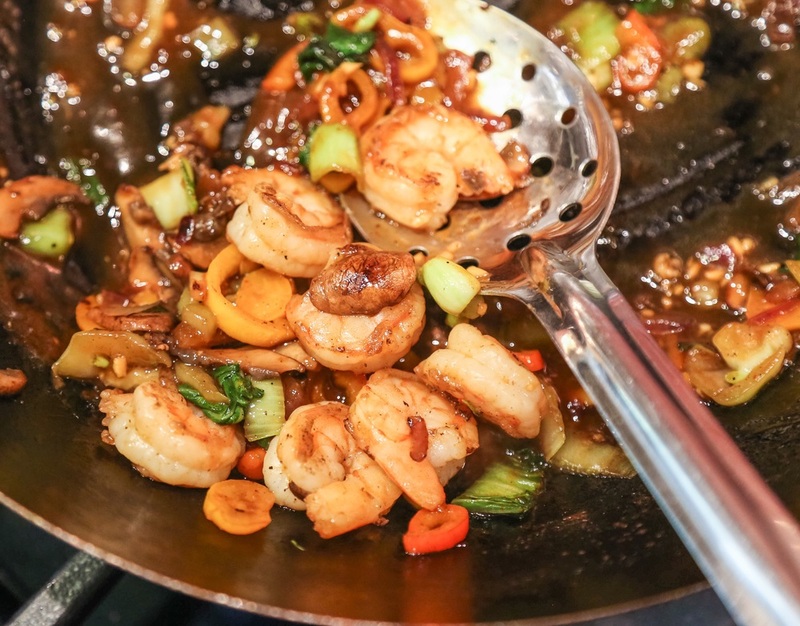 Heat a wok or skillet on medium heat, add 1 tablespoon oil then put in the minced garlic and ginger - stir and cook about a minute or until very fragrant, don't let it burn. Add soy sauce, water & brown sugar to the wok - mix and let boil about 2 minutes then add sesame oil; remove to a bowl. Serve on rice, garnished with finely sliced green onions and sesame seeds. * Finlandia butter is available at Vons, Albertsons, Safeway and Costco. Trust me, no one will be disappointed…. Meanwhile, combine butter, thyme, mustard, lemon juice, garlic & salt in small pot over low heat until melted – keep warm. Using kitchen shears, cut right up the middle of the shell towards the tail, but not through the tail. Using the cut as your guide, use a knife to cut down through the meat but not through the bottom shell. Pull back the sides of the shell to expose the meat and brush well with the butter mixture – set aside. Heat grill to medium/high, rub steaks with olive oil, season with salt & pepper and cook about 5 minutes, flip and cook another 4 minutes or until done to your liking. Remove steaks from grill, cover with foil and let rest about 10 minutes. 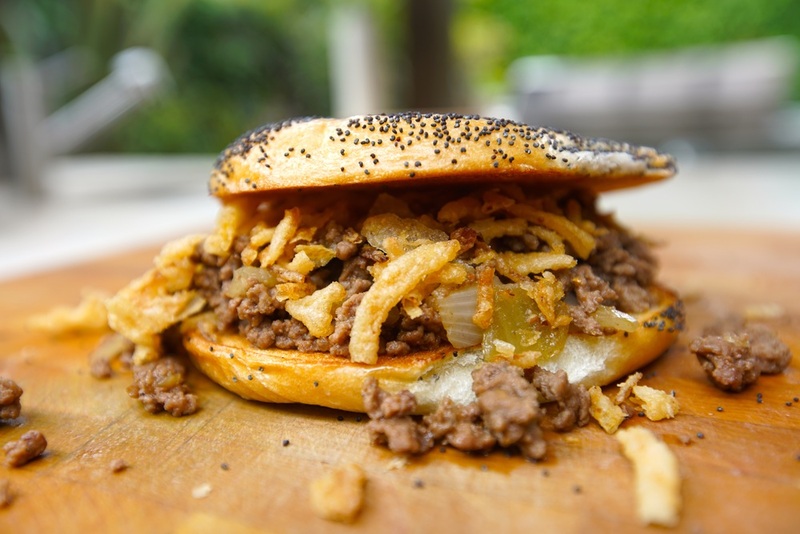 If you can find ground brisket for half of this, you'll be very happy cuz it'll add a ridiculously good beefy flavor. This is essentially a hamburger with no structure. And if ur not from where they're popular, you might think they sound gross. But they’re anything but - in fact they’re effing great! A Southern California classic… never had em? You are in for a treat. One of my all time favorite foods, never fails to please. Serve sliced on bed of onions, enjoy! This is so delicious. A great party food appetizer, if you are entertaining, the blue cheese pairs well with good bottle of red. Evenly drizzle over 2 tablespoons balsamic reduction, cut and eat. Build: roll, veggies, steak/cheese, veggies and eat! This is a staple meal in our house – protein with a bunch of greens, so quick and delicious. I can get it on the table in 10 minutes. Serve the salad, topped with sliced steak (cutting against the grain), drizzle over a little more dressing.